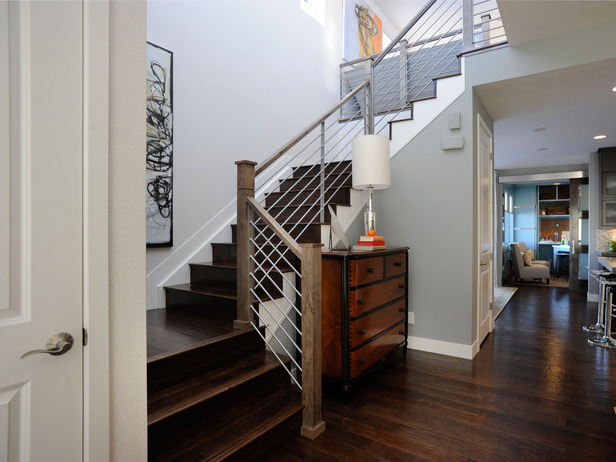 Have you seen this year’s HGTV Green Home in Denver, Colorado? It was “inspired by the architecture of Frank Lloyd Wright, combined with subtle nods to airplane design,” which I guess explains the wing over the front door. Let’s take a look around and see what you think. The floors are hand-scraped maple. The living room sets the contemporary tone for the house. It really qualifies for one of my “One of these rooms is not like the others…” posts, doesn’t it? I mean, wow. My 8-year old daughter would love sleeping here. My brother-in-law who visits twice a year…not so much. So what do you think of this year’s Green Home? Despite some of the complaints I had about it, I prefer last year’s. This one leaves me a little cold. I wouldn’t complain if they gave it to me, though! Will you enter to win it? 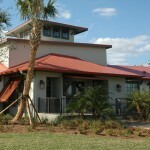 For more information about the house, you can take the full tour and enter the sweepstakes on HGTV.com before June 2, 2011. The Braverman Family Homes on "Parenthood"
I think this is a beautiful and well designed home. If you asked me if I had to build a house if I’d the same, I’d say no. But That’s because I’m not crazy about contemporary style. But it’s definitely a beautiful home. I like it more than I expected, based on the exterior. However, it seems a bit disjointed. Maybe it is because the ‘family room’ is upstairs. I would call the area adjoining the kitchen the family room, and the loft space more like a den. I am not liking that hot pink guest bedroom! Oh, but I do think the hot pink carpet in that guest room is way over the top. Yuck! UGH. ( But then I am a huge fan of the Braverman elders home, so what do I know?) Seems to me though that this home could use some cleaning up in terms of decorating- as “Things that inspire” said: disjointed is the best word to describe this home that I have read here. Schizoid may be a better one, come to think of it! I love it! They refer to the pink room as the “girl’s room” on the HGTV website. I like it, maybe not for myself to sleep in everyday but it’s definitely good for a girl! I love the loft area as well and I don’t think the house feels disjointed, it’s just not quite the open layout that is so popular these days. That’s interesting. I read it was a guest room, but it makes much more sense as a girl’s room! Have to say I’m not digging it and I usually love prairie style homes. I love the Prairie style, but I see nothing on the interior to say that. The exterior is nice but the off kilter overhang bugs me, as if there is something structurally wrong. I think there’s too many trees for the small lot. I like the living room wall. I assume those prints above the fireplace slide to the side to reveal a tv. I would have preferred the wood behind the bed to be stained or painted, it reads as industrial wooden pallets in their raw state. Ummm… I’m not feeling that laundry/craft/office/ what are they thinking?!? room. Those desks aren’t big enough to do any crafts or office work anyway. Get rid of the chairs and the office feel and it’d be a great place to fold and organize the laundry. My favorite room? The master bath! It’s lovely. Really? I LOVE the do-room! I love the “station” feel. I do with that one would “hide” the laundry. Perhaps I would change one of those stations into a sorting area for dirty laundry. I really love that room! I wonder if I would be OK with the view of the air traffic control tower? From the special on HGTV it seems it’s right in front, and I don’t know if I could look at it, even though they say the residents of the development wanted to keep it as a reminder of it’s past as an airport. I like laundry room/office thing if you’re using the office space for light tasks like paying bills and such. I don’t think I’d want to write a dissertation or something in a space like that but for everyday stuff, I think it would be pretty handy. Stapleton is the site of the old airport, so I don’t think airplane noise should be a huge problem. Denver’s new airport is DIA, and I think is located in a somewhat different area. Nichole, You’re right, DIA is out in the middle of nowhere… you have to drive 10 miles off the highway through fields and fields to get there. Not crazy about this. The wing over the front door drives me a bit nuts. And I think the interior will be dated pretty quickly. Yikes…that guest room must be sponsored by Pantone – that’s their color of the year, 18-2120 Honeysuckle. I do like the efficient scale of the house, but that laundry room brings back too many bad memories of trying to do homework in the laundromat during my college days. I do like the plan – but not the color choices. I 100% agree with you on the “laundry room”. It wouldn’t work for our lifestyle. And yes…I have entered to win it! My favorite thing about this house is the bird comforter. It looks smaller than most HGTV giveaways, doesn’t it? I mean when they have to combine, laundry room, office, and sitting area into one place, it seems cramped. The style for me is too dark and the pink room is just too pepto bismal. First impression is that it seems smaller than the houses in the past. 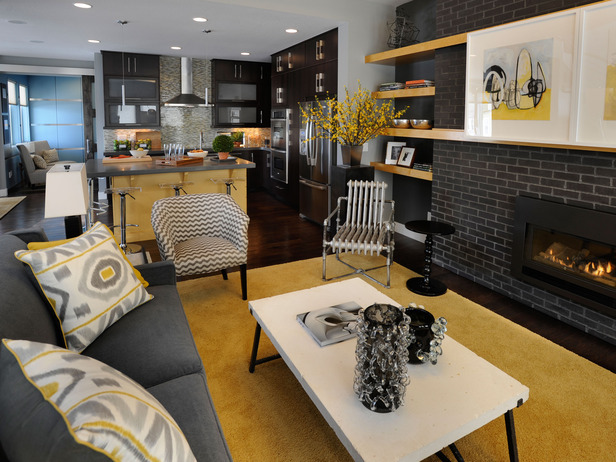 I like the wood floors but I don’t care for the too modern and masculine gray and yellow look. A family room should be next to the kitchen.. not upstairs and gosh it’s tiny…looks more like a small den to me! The laundry room should have a counter height table or island for folding clothes rather than two chairs. And the shock hot pink carpet is too much for the pink room. They should have extended that lovely dark wooden floor into the girl’s pink room. Overall it’s not bad. But….someday I wish they would do more of a cottage and/or beach designed home. Now if they had picked turquoise instead of gray and yellow…..I would be in heaven. I am not usually a fan of contemporary but I like it for the most part. I agree with the laundry combo room needing a place for clothes as well as the strangeness of the pink room but it is nice. It definitely feels like more of a place you would rent for the week or month than a real true home though. I think I Like this house… a lot!! I’m registering to win it, and registering my husband’s name too, but we’d just sell it. It’s way too contemporary and trendy for me. The only room I kind of like is the master bath. I love it. I’m not sure I’d keep the pink but I like a house where the rooms are all a little different. I disagree with you and Gilleybrook on having the washer and dryer in the officel – it seems pretty convenient to me and if I had laundry piled on the chairs, I’d be less likely to pile papers on them. On the other hand, as Tabitha and Gabbie pointed out, the desks are a little small. Anyway, if I lived in Denver, I’d definitely sign up – Who doesn’t want a free house? I think those “desks” actually have tables underneath them that roll out and come together to fold laundry on. It’s a beautiful home built for a regular family that a regular family can’t afford. I heard somewhere once that in the history of the HGTV Dream Home giveaway, no one has ever actually lived in it because they can’t afford to pay the taxes on it. If they really want to have a successful sweepstakes like this that can actually be lived in my your “average joe and jane” then they need to focus more on affordability and sustainability rather than glitz, glamour and shine. If this house were to go on sale in the open market it would start somewhere around $500k or more…probably more. That is an unrealistic price for a home in most markets. I DISLIKE these homes because they showcase “high design” with a “high pricetag”, which turns off so many people to contemporary design by making them think it’s “out of my reach”…which is COMPLETELY untrue. Nice house, sure….but it could be so much better and affordable. Love the exterior!! The smaller size and colors are all fantastic except for the pink room. So nice to see diversity in architecture. I liked the other homes better. This one appears odd shaped, very cold and has no warmth to me at all. The color schemes are none that I would have picked and the house has no flow to it. I prefer more wood with earthtones and NOT metal with gray or a Pepto Bismol pink room! Blech! I did like the little laundry/crafts room, but the house overall seems a lot smaller than the other ones. Their choice of art for decorations is pitiful at the least and not to my taste. This house to me is a total turn off and nothing I’d want to win, so I don’t plan to enter. Hope someone else enjoys it. I’ll enjoy our new GREEN, stacked stone home we just bought instead! I much prefer last year’s! Obviously this is a beautiful house, but it’s not my thing really. I’m more into traditional or old houses and modern and contemporary. More modern interiors are boring for my eyes. It’s the perfect size. I love every bit of it. …Except for the pink room. Was the pink carpet really necessary? That room seems to produce it’s own glow of pink light it’s so bright! We live in Denver so the location works out for us, but I don’t think the style really suits us. It might just be the way they’ve decorated it. The boys’ room was kind of cute, and I love the outdoor space. My question is, why does “green” always seem to = “modern.” I would love to see a green home in a more traditional feel…can’t you make a “Father of the Bride” or “Stepmom”- inspired home green?? Clearly I am not a modern fan, but would like to know if there is a pragmatic reason green always seems to be modern. Try as I might to find one thing, anything, that I liked about this house, I just couldn’t. Also, that sectional in the family ‘room’ upstairs? Not very family friendly when you have crawling babies trying to climb over the top of the couch. That thing is backed up to the top of the stairs. My kids would probably dare each other to jump off it. Also, what is up with the radiator chair in the living room? Is it actually heated? The house seems very uncomfortable to me. Is the radiator chair heated? HA! Funny. I mentioned the chair a few posts back. It is a really odd design element. Not only unattractive, but I’m sure uncomfortable. I think the idea behind it is that it’s recycled or salvaged, so therefore “green.” I think it’s a stretch to say the least. I agree, I like last year’s house so much better. I would take this one if I won though, and it wouldn’t be that much of a move because I live in Colorado Springs. Even though I think the girl’s room is over the top, my daughter would love it. I think I would have to tone down the wall color to make it livable though. I also think all the modern art would have to go, not a huge fan. I’m glad to see HGTV finally living in the real world of utility costs. I think the front porch room just looks crooked, not innovative. That dark brick around the living room fireplace is soul-sucking. The bar stools in the kitchen look like they are designed for size -3 fashionistas, not average-sized men or wiggly children. The weather changes on a dime at Denver’s altitude, so the chic fluffy pillows and upholstery on the visit-the-neighbors deck were toast within a week of the picture being taken. Grey should be used a unifying neutral, not a default color. Since when is hand-scraping anything a green choice? I think Barbie would find that guest room too pink. Other than that, the house is fine. I didn’t care for last year’s home, but now after seeing this house, it has grown on me. Nothing about this home feels like a home and I don’t like the style at all. Like one person said up above, Why does most of the “green” HGTV homes have to be modern and contemperory? Why not do some different styles like craftsman? Sorry, but this home doesn’t work for me. Didn’t Marcia, Jan, & Cindy once share that guest room? Why do you think they put two pendants over one of the bathroom vanities and only one over the other? From what I can tell, they appear to be the same size. It jumped out at me right away. My guess is because the vanity with one light is next to a window, so it’s brighter in that area, whereas the other vanity facing away from the window might be in a darker area that extends to a passageway beyond the photograph, or it faces another dark area on the opposite side. Just a guess. I don’t love it, but don’t hate it. The yellow/grey color scheme is not my favorite. I kind of like the idea of the office/craft/laundry, but I would prefer a long counter or desk instead of the two chairs. I saw on the special (just caught the end of it) that the desks are on casters and can be moved to the center of the room for folding laundry or crafting. I do like all the built in storage and the color scheme in that room. Not a fan of the master bedroom AT ALL, but the master bath looks lovely. And that radiator chair? WHY??? Sure, it’s green, but so not functional, which really is the whole point of the green home, to show that you can have a green home and still have it be stylish and functional for the way people live today. I like last years house much more and even that one wasn’t as great as some past years. Kind of disappointed that the houses seem to be getting worst and uglier every year! A big thumbs down from me. I’m sure there is an audience for it but i think it looks like corporate building lobby. It always angers me when the elitists tell all of us what we should like and what we should do. They built some houses so close together in Orange County, 7 in a cul-de-sac surrounded by identical cul-de-sacs, and the kids bounced basketballs off everyone’s walls. There were NO driveways, so you either parked in the garage or on the street and the streets were just LINED with cars. Sorry, NO, I don’t want to live this close to people or live in an ugly house just to be green or have a front porch to have the neighbors over! I’ve only liked one of my neighbors in 20 years. I just hate all this “green” stuff. Once you’ve bought energy-saving appliances, I am pretty much done with the effort. I am not a fan, to cold and sterile… As far as the gif room/ laundry room/office goes, I really didn’t get that. Who wants to squeeze into a corner to wrap presents??!! Last year’s Green Home is much better! It almost seems like they tried too hard with this one…it’s too cold and uncomfortable-looking. Love Love Love your website, Julia! Thanks for all your interesting posts! I like it, but I’m fond of the yellow and gray combination, as long as I could throw in some royal purple. The hot pink room is overwhelming, but my daughter would love it. I don’t like the patio out front, perhaps I’m anti-social, but I want my gatherings in the backyard. Finally, I would be happy to have a proper crafting space and wouldn’t mind sharing the laundry room to get it. It would be especially helpful with quilting, although I would say that the actual crafting space is too small and not really designed with actual crafters in mind. I really didn’t like it that much to be honest. BUT if they wanted to give it away…who am I to say no! Not a huge fan…I like a place that feels lived in. A sitting area in the laundry room is rather odd. A room like that really makes me feel like I need to catch up on my reading or have a cup of coffee with a neighbor..NOT;) love your blog! Bleh, not really my style either. I usually enter their contests each year, but think I’ll pass this time round. What do I think of it? Not much! Why does “green” design always have to mean modern design and bright colours? If that’s all that “green” is about, I won’t be going “green” anytime soon. Looks fantastic. Beautiful detailing and well put together schemes. Love the influence of the timeless Frank Lloyd Wright on the exterior with the proportions. The distinctive canopy really draws attention the entrance -simple but grand. Not a fan. Looks like a townhouse layout without factoring in at least a 1/2 bath on the first floor and an attempt to do something with laundry that doesn’t work. However, it has a better layout than most Dream Homes that get worse every year when they just throw out function from the design. My favorite part is the front facade. I’m trying to think of something nice to say, but I can’t get there. Mostly I am just *so tired* of them using the same interior designer for every home. It shows. A lot. And I don’t like her style or lack there of. It’s repetitive, boring, lacking in usability, and in this case in what I can only guess is an attempt to be fresh: disjointed. Which I know sounds so…mean, but gosh can’t we get someone different already? This is like a really bad rip-off of Jeff Lewis. Not going to enter. I wonder how many of these people keep these homes? Don’t they end up having to pay 40% of the home’s value in Winner’s Taxes? Just a thought…and though I like the house, I wish that they wouldn’t feed into the theme that Green = Modern Style. Cold, hard, uninviting. Not homey. Not crazy about the pink bedroom, in fact using in a presentation about what I would do to CHANGE a room. No thanks. I’ll save my odds at winning on another house. This one doesn’t do it for me at all. In all honesty, I probably feel cosiest in that weird laundry room. I’m not into contemporary styles for myself but like the style when it’s well done and not too “cold”. This one isn’t cold and is nicely laid out. I think that the pink girl’s room fits the contemporary motif. It’s just a loud pink as a nod to a girl (hopefully) that really loves the color. I don’t have a problem with that. Overall, it’s not a bad place even if it’s not what I would choose for myself. My first reaction was: It’s not huge. I LIKE that. The kitchen looks a lot like mine, but I do hate those stools. Are they actually bolted to the floor? Blech. The pink room is ridiculous mainly because of the AMOUNT of pink…I mean a little fuchsia goes a looong way, tight? I like the master bath–but it looks like it was one of those “done on a tight budget”–which I am sure it was not. Overall? Just “Meh” for me. Meh. But if it’s free I’ll be happy to take it. (Oh my gosh! I now see that “Ann” also said “meh!”) Creepy!! As someone may have pointed out before there is no “guest” room. It’s just a Master, the boy’s room and the girls’ room, hence the pink. So maybe there’s a pull out sofa for the guests? I also don’t like how the architecture doesn’t match any other house in the whole development, which seem to be traditional with a front porch. But all that being said my mother wants to win it so she can be closer to the grand-baby. I think this is my least favorite of all the houses they have done. The gray and yellow may be hot right now, but I think it is cold. It makes me think they added the touch of yellow to brighten up a hospital waiting room. The front of the house does not look welcoming either. For those people who like contemporary it is probably a beautifully designed home and that is what makes America great!!! Something for everyone. BTW the pink girls room is the only thing I liked. It looks fun. The same plan is used by the developer elsewhere in the neighborhood, it’s just been “tweaked,” for those of you who think this is some foreign object dropped from the sky. The downstairs laundry/craft room is typically used as a study, which makes more sense since it is just off the living room, and the laundry area goes upstairs in a niche off the master suite. Isn’t the pink rug an area rug? Easily removable for those who find it so objectionable. Likewise, the radiator chair is not fixed to the spot. I pretty much like it all except for the master suite headboard. I’d be in there with a crew to take that thing down right away. I think HGTV completely misses the point of “green” design by building from the ground up. The most sustainable choice would be to lovingly and carefully remodel an existing home. Not really my style.. kinda offish.. not for me. It wasn’t horrible but it wasn’t with a comfortable, cushy at home kind of feel.. It was way too modern in the pink bedroom.. There would be a great deal I would change about it. The house itself isn’t something I would shop for either.. Interesting piece to read about though. I am really warming to contemporary designs and I actually like this homes’ functionality much better than the hgtv dream home 2011. Not that I wouldn’t love a place in Stowe VT but the home had some really quirky design elements. The house looks ‘photogenic’ for TV, but I could never imagine actually living in it. The wall behind the bed in the master bedroom resembles an industrial palette. It seems small, kooky and disjointed. 1. The cold feel, maybe it just needs real people to live there? 2. The radiator chair wierds me out…maybe put a cushon on it? 3. The stick chair, likewise wierds me out. 4. The laundry would be better suited upstairs in the “nich” by the master. 6. It’s a little dark, I would lighten up some of the rooms. 1. I LOVE the do room (even if the laundry should go upstairs). 2. I love the feel of the outside. 3. I love the dogwashing “station”. 4. I love the pink room (weird, I know). 5. I love the master suite. Ultimately, the house grew on me and I can picture myself in it. My personal style is quite different, and I would like to see more traditional green homes in the future. But I want to live there so I’ll be trying to win… Although the chances of that are slim. I would love to win it, but before I moved in, I would hold one heck of a garage sale. I would dump all the local “art”, the funky stick chair, every thing PINK, every thing yellow, the master bedroom headboard, the stupid radiator chair, limestone coffee table, Radiator lamps, zebra floor in the boys room, and the glass bottom bar stools. I would hope to get enough money to buy some paint to re do most of the walls with real colors. Also I would hire an archietec to remove the still flying porch cover and put a real front porch on the house. Same for the silly deck cover. I guess you can tell that I am not impressed with this mess of a house. I don’t think many people will really like it. I am going to try and win it, then sell it and buy some thing I would really live in. Green, brown or Hot pink I don’t like this house. It does nothing for me. I think it is time HGTV changed designers. The last few houses have really been out of touch with most of America. BUt wish me luck I could use the money from the sale. I loved the contemporary design and the colors used, even the “Pink” room. I do not believe this house would be good for very small children — not enough play room. I would like to have seen more of the kitchen by opening cabinets, seeing drawer depths, etc. and there was no trash compactor and not sure about a broom closet (forgot to ask). Take a trip to your local landfill — to me a trash compactor is a good green item. The niche to me would be a better office space instead of the “To Do” room. I loved the glass tiles in the kitchen. I loved the xeriscaping ideas. My husband and I enjoyed the tour very much. Forgot to mention another item I loved — the doors!! We live near Denver and are familiar with the area where this home was built. The area, Stapleton, used to be Stapleton airport. The place is just a newer, more expensive sea of houses and flat nothingness — as you can see out the windows from these pics. HGTV is really slackin’ on this one. Sure, I’d take it, but only to sell it right after! I love it! The porch is beautiful, as is the master bathroom! My husband builds model airplanes and just won a Best In Show at his first contest, so the plane theme works. OK, ok……maybe the pink room is a BIT much, unless a baby girl is in our future. BUT, I can’t wait to move into it and be back home! I can already see myself cooking in the kitchen and entertaining on the patio. I miss my family and my son is missing out on seeing his Grandparents. I knew it was made for us when I saw the “Do” room! We often call our son Doo! (Doo made a doo…ha ha!) See you soon Green Home and our families in Colorado! We miss you all and love you so much! Oh, I forgot to mention the dog washing station….what an awesome idea! I love to do my own grooming, but hate to mess up the tub. 🙂 So, this really is a dream come true and an excellent addition to a beautiful home! Thanks for building this one in my home town! I miss Colorado….friends and family….can’t wait to return! I love the home and hope I win it. I would actually move there and live in it and not sell it. I love Denver and Colorado and I can afford the taxes on the 700k easily so if I win I will move there . I may sell the auto though seeing I prefer european cars and I have a nice Volvo XC60 …. The one thing I don’t like about the home is the porch and grill being at the front of the house. I know they say its to encourage you to interact with neighbors but to be honest I don’t want to interact with my neighbors . I don’t want my neigbors watching me out their window while i set on my patio grill and drink beer. I would prefer a more private area for that. Also I like to walk around in my speedos outside so Im not sure how well that will go with the neigbors. I think this is the worst design of any of the HGTV homes Green or other wise. I think they just went off the deep end on this one. I signed up to win it, but I would never want to live in it. LIke so many others my dislikes start at the “bent” front porch cover and front patio. I would NEVER sit out like that, Much of the quirky furniture would be sitting on the curb for pick up mins after I bought it. The Radiator chair and the chair made from bits of wood would be the first things out of the house. I love art, but I don’t like very many of the “things” in frames they chose here. OUT! I would buy several gallons of paint and change the gray to some thing warm and inviting, I hate gray and no BLUE or PINK OUT!!! Even though I signed up to win this house, I don’t want to win it. Too much trouble even to try and sell it. But like I said, I could never live in it, NEVER. Dear Julie: I’ve been trying to find locate who has the bedspread for sale in the master suite the bird design above, Asian chic, and or bird design Botanical, would like to purchase it for a friend who needs comforting and loves birds. I’ve been all over the internet and can’t find it at all. Can you help in anyway, a thought when I saw a video ARHAUS furniture, that was the diningroom table had bedding but not that store. Can you help assist me in finding it or tell me how to find or locate it? Thankyou, Julie for your time and trouble. Love the house too, different guess I like nature. I’m afraid I have no source info, but it should be on HGTV.com if it’s anywhere. Check there! I live 5 minutes away from this house and finally had the chance to tour it. The overall scheme isn’t my cup of tea but there are some nice touches. I’m partial to the frosted barn doors and the wood inlay in the boys bedroom was a lovely touch. The Ipad control was a neat feature but unless they’re giving away the Ipad with the house I don’t imagine many people will have the ability to remotely control their house from work quite that easily. Some odd tidbits that I didn’t understand were their choice in blinds on the upper windows. They’re not automatic and when I asked the guide how you opened and closed them he proceeded to show me a metal pole…lovely. The Astroturf in the backyard threw me and seemed so out of touch with the fantastic xeriscape they had in the rest of the yard. The basement of this house remains unfinished to maintain it’s premier status as a green home. Complete the basement and you lose that title. The charm of this house comes from it’s surrounding neighborhood. This is one family friendly place and I think I spent more time checking out the neighbor’s houses then I did the green home. You’re not going to find too many places in Denver where you can have colonial, Spanish, prairie modern and coastal bungalow architecture so close to one another. As for those mountain views you win with this home…we’ll see if they stick around. The lots are filling fast and I’m guessing whoever wins is going to be competing for a view. One of my main dis-likes is the upstairs railings (and the couch pushed up against it). My boys would be climbing up and over them in an instant. It amazes me that everyone completely dislikes this house. If I can remember correctly there is a powder bathroom on the first floor. This house compared to the Green Home from last year is beautiful and new. I enjoy it when a builder takes homes in a direction that others typically would not. Sometimes you have to look past the decorating and look at the bones of the house and this house has good bones. I did tour the home and absolutely loved it. I have looked at several homes in the community of Stapleton and everyone sits out on their front porch and talks to their neighbors. This is really a family centric community.